We love a good celebration! This week focuses on those special occasions in your life. Yes, we’re still a good two months out from (American) Thanksgiving, and no, I’m not planning for it yet. In fact, I think this year will be a relatively low-key holiday. We’re staying in Maryland and going to Steven’s mum’s and stepdad’s for dinner, and they are pretty good at providing animal-free alternatives (like butter-free mashed potatoes and a turkey-juice-free stuffing). I anticipate needing to bring a main, a side, and a dessert, and I’m totally OK with that approach. 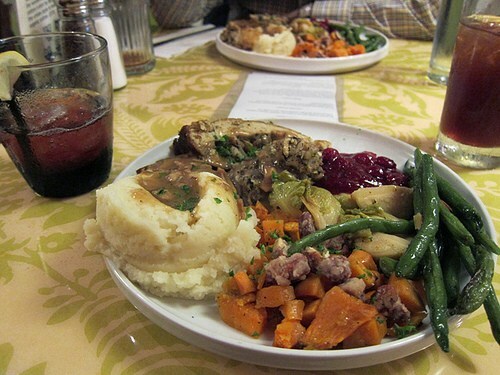 My first vegan Thanksgiving! Silly newbie food blogger that I was, I have just a single ridiculous photo of my sister and I baking in my parents’ kitchen… and then a long, photo-less post about everything we ate. 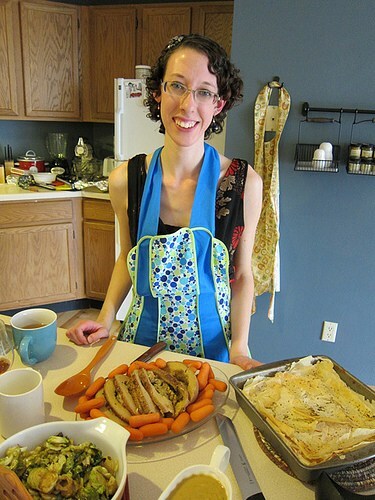 (Ignore the eggs in that photo; the pie I was making was vegan!) 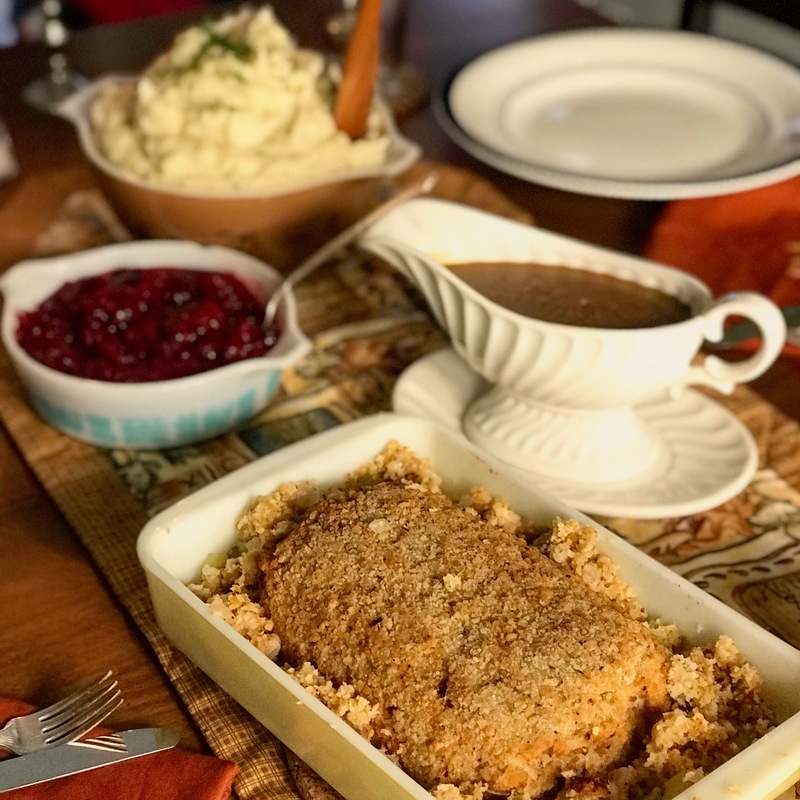 Reading through this post also reminded me of non-vegan Thanksgiving of yore, like when I was newly vegetarian but didn’t think to ask my family to make a gravy sans turkey fat! A gravy-less Thanksgiving is a sad Thanksgiving indeed. Aww, little Kelly celebrated Thanksgiving alone! This was my first year living in Madison, Wisconsin, where I moved from Rhode Island for my first post-college job. I can’t remember whether my roommate also stayed or whether she flew home to New York State. 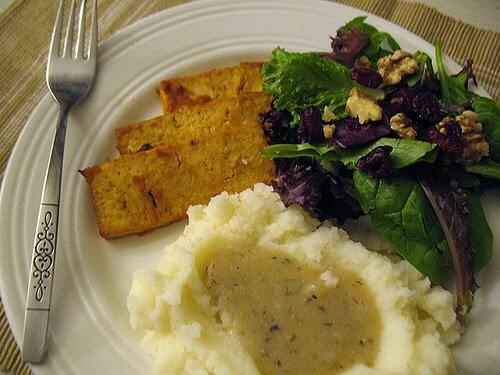 I (apparently) enjoyed a pretty simple dinner of tofu, salad and some last-minute mashed potatoes I whipped up when the craving struck. I also apparently spent the day knitting and watching movies. That… sounds like a pretty darn good Thanksgiving, actually! Our first Thanksgiving after moving to Maryland. I remember nothing about it and can find no photos. I think we drove to Rhode Island but I have no idea! I do, however, know that we visited Poplar Spring Animal Sanctuary earlier in November for their annual “Thanksgiving with the Turkeys.” It was magical. 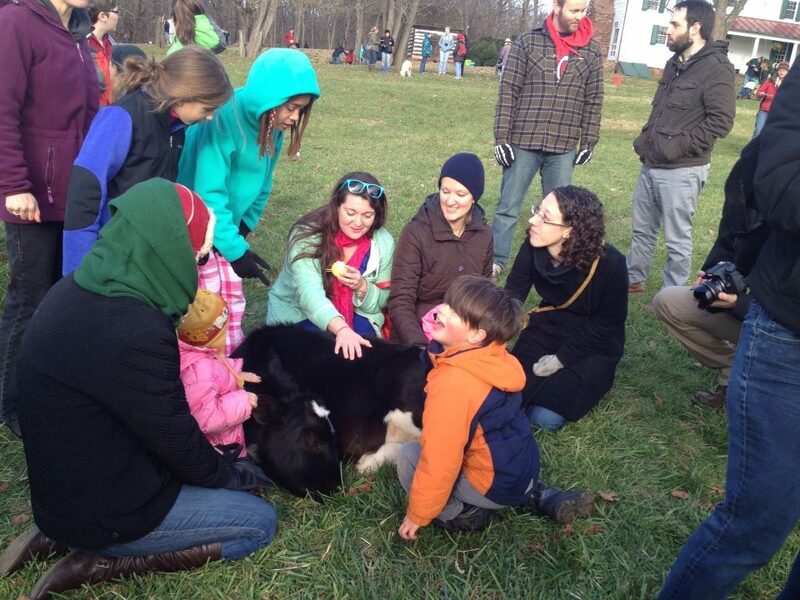 Hundreds of vegans, vegetarians, and veg-sympathetic people converging on a farm animal sanctuary for a potluck dinner. There was so much food! We stuffed our faces then watched the main event: feeding the animals! The turkeys got showered with veggies and other delights, and then the pigs got piles of pumpkins. We had so much fun watching these sweet, smart animals going to town on a feast. It was a frigid day, but it was worth it. A powerful reminder of why I don’t eat animals! This was a tough one! We’d planned to drive up to RI, but our apartment flooded (!) just before the holiday and so we stayed put. This was also just a couple months after we’d adopted Luna, and we weren’t sure how she would do in a big family gathering. Plus, she was recovering from an abscessed tooth and was a bedraggled mess (you can see her cone o’ shame in the above photo). We got the all-clear to head back to the apartment just in time for a very last-minute dinner, which I think was just a Field Roast and a few quick sides. We were just thankful our apartment and Luna were both on the mend! We started the season with another trip to Poplar’s Thanksgiving event. I remember this one as being much warmer than our first visit, thankfully! It was almost overwhelmingly crowded. While my crowd-averse self did not care for the hordes, I also realize how amazing it is that hundreds of people would come to a very pro-vegan event like this! We followed up our Poplar trip with a drive up to Rhode Island, where we enjoyed massive quantities of vegan food. The day after Thanksgiving was unseasonably warm, and we decided to #optout of Black Friday shopping (not that I EVER partake) and went for a family walk by the shore. My favorite memory from that day? My sister zipping Luna up in her vest when Luna got tired of walking. I miss my pup so much. We again drove up to Rhode Island to celebrate. These days, holidays in Rhode Island are spectacular since my mostly vegan family members contribute all sorts of delicious veg dishes. My planner of a mother comes up with a list in advance, but it usually has a few blank spots: “Ian: ?? ?” Although my brother doesn’t always make it back to RI for Thanksgiving (nor do I, for that matter), when he does, he’ll whip something up nearly at the last minute. That usually involves a quick run to the grocery store the day before. I say “quick,” but if you’ve ever hit up an American grocery store just before Thanksgiving, you know that it is never quick. I refuse to make those ingredient runs and always provide a list of what I need ahead of time! This year we had a Field Roast and plenty of sides, along with some beautiful sweet treats. Steven and I hosted at our place; it was our first time hosting at our new(ish) house. Steven’s mom and stepdad came and seemed to enjoy all the food. I cooked almost exclusively from Isa’s Superfun Times Vegan Holiday Cookbook and had sooo many leftovers… which is always a good thing! We tried a veg roast from Trader Joe’s and it was not bad at all. Other highlights included creamy whipped potatoes, green bean casserole, and an orange-y cranberry sauce. So, there we go. 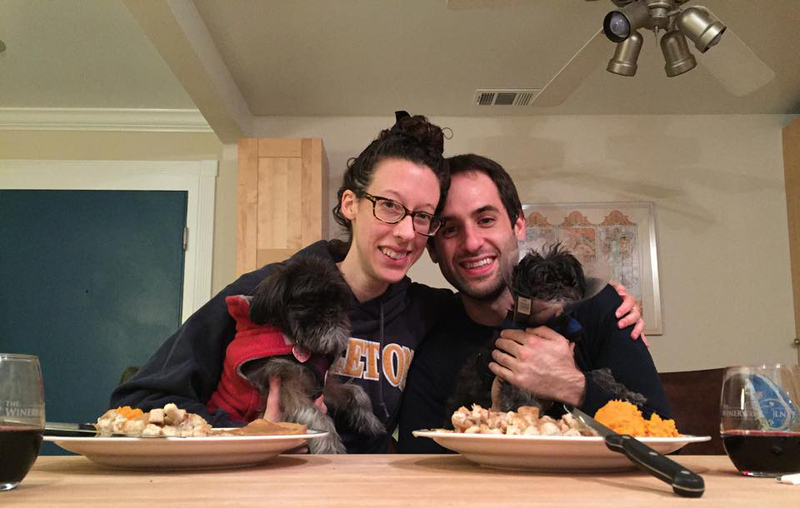 Nine years of vegan Thanksgivings, all of them special in their own way. And all of them delicious.